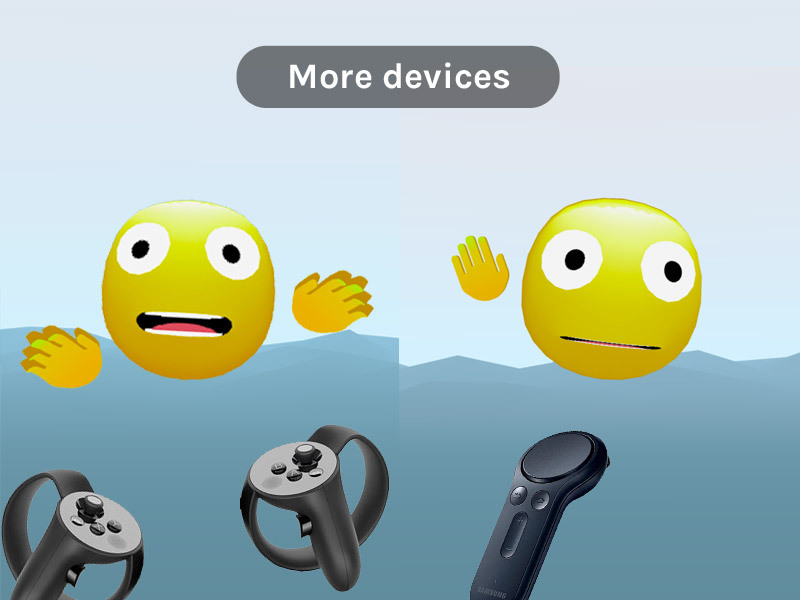 The idea "How to create the simplest way to chat with avatars on WebVR"
WebVR development has a lot of constrains but we need to take advantage of the open web APIs like WebRTC or powerful specificationS like glTF2.0 to create different experience like native VR offer us. 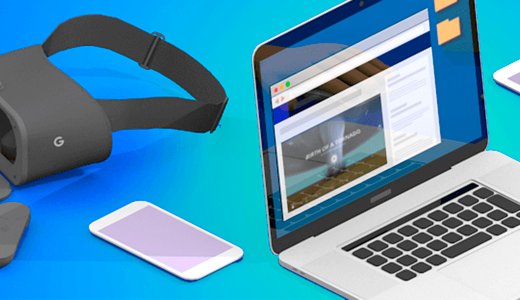 This was the basis of my idea to create a simplest way to start a chat on WebVR using a progressive enhancement design strategy as I used on previous works to make this project accessible for as many users as possible. 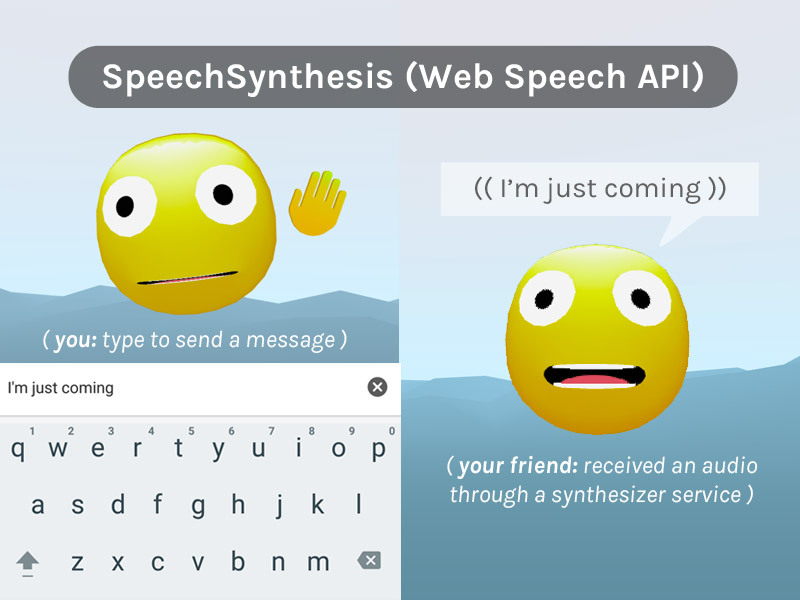 The mechanic is so simple, enter at talk.unboring.net, copy a link with your roomID, share URL and when your friend will be connected, you can start to talk thanks to the WebRTC protocol. As this project is using glTF2.0 format to the 3D content and I needed a real-time network library for Three.js to make it possible, I contacted with Takahiro who was working on both open source projects related with these technologies. And he helps me to use their libraries and to add some features needed to make this project possible. 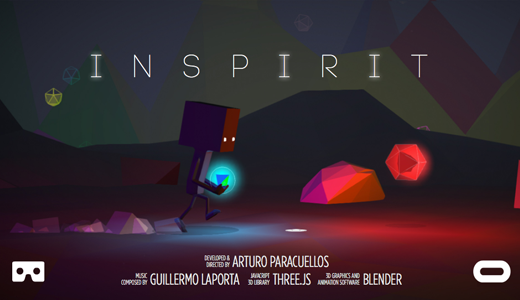 This project started with a failed attempt to port this old demo from mid 2016 that I have made with customized avatars which have bones and moprh animations. But now this workflow doesn't work, I was frustrated and I tweeted about it, and thanks to this tweet I contacted with Don McCurdy from Google (@donrmccurdy) and Gary Hsu from Microsoft (@bghgary) who help me to find a workflow to export morph animations from Blender to threejs that is explained below. In this old project you can change the aspect of the avatars, changing its texture, some of their elements like hair or glasses, and you can animate them with morphing for breath, blink or change the size of the arms, agbomen or legs, and animating bones you can walk or run. But in addition to the technical limitations, watching the latest videos published related with how to create avatars for VR at Facebook F8 confereces 'Making Facebook Spaces' (highly reconmmended) or at Google I/O when they shown their avatars for Youtube VR I knew that the best option was to start simplifying as much as possible. 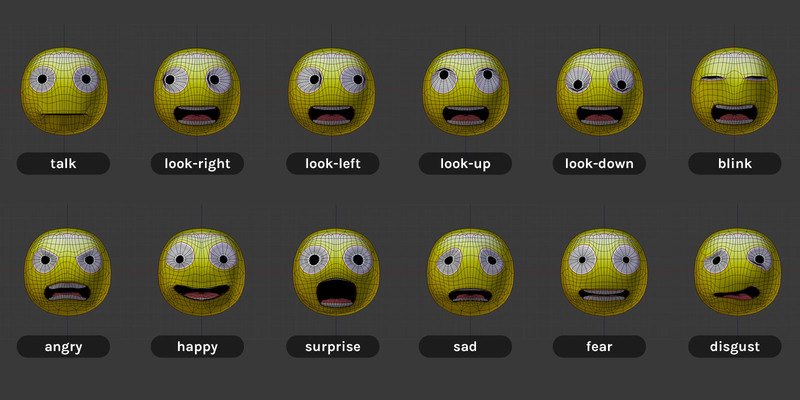 The simplest but (I hope) fun option was to create an emoji, I was researching on how is the best way to modelling a face to be possible to make multiple animation to having expressivity. I learned a lot about face loop with videos like this. At the end, I needed 12 Shape Keys in Blender to be possible to blink, talk, look around and to have the eight basic expressions. As I said before, thanks to a tweet and the help of @donrmccurdy and @bghgary I got it a workflow to using Blender and Unity could import glTF2.0 animated models working on a Three.js WebVR project. 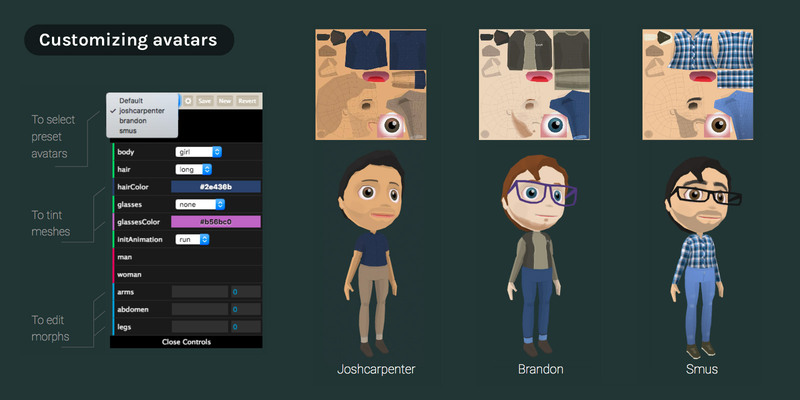 Unity: Import glTF Tools for Unity and to export it. Threejs: Use glTF2Loader, and the mesh imported will have all its morphTargetInfluences accesible. This is a provisional solution meanwhile I was waiting for glTF2.0 to be completed, that was two days ago and I suppose that soon we will have an exporter working. In the other side, the glTF2.0 importer for Three.js we are lucky because people like @donrmccurdy or @takahiro was working on it and now is almost completed and working with 86dev version of Three.js. All this part was possible thanks to the awesome @takahiro project ThreeNetwork a network sync library for Three.js that supports PeerJS, EasyRTC, and Firebase. In our experiment we are using Google Firebase and WebRTC to stream audio between two users connected. 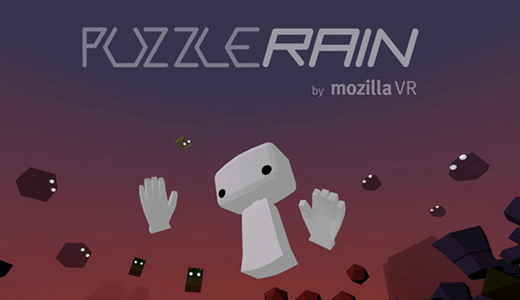 Another challenge was to implement left-handed on Ray input library which is very useful to support any input abstraction for interacting with 3D VR content in the browser. And to add a mesh for the Daydream controller, for this I used the mesh and textures provided on the Google Daydream Elements Unity project and I ported to glTF2.0 to use it here. 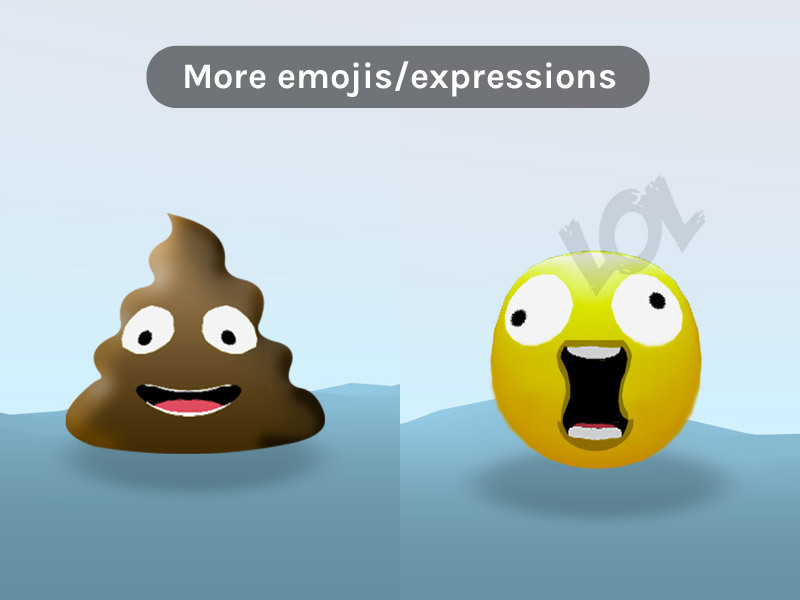 Add multiple meshes to different emojis and to create fun expressions like 'troll', 'lol' playing with gpu particles to improve the fun effect. 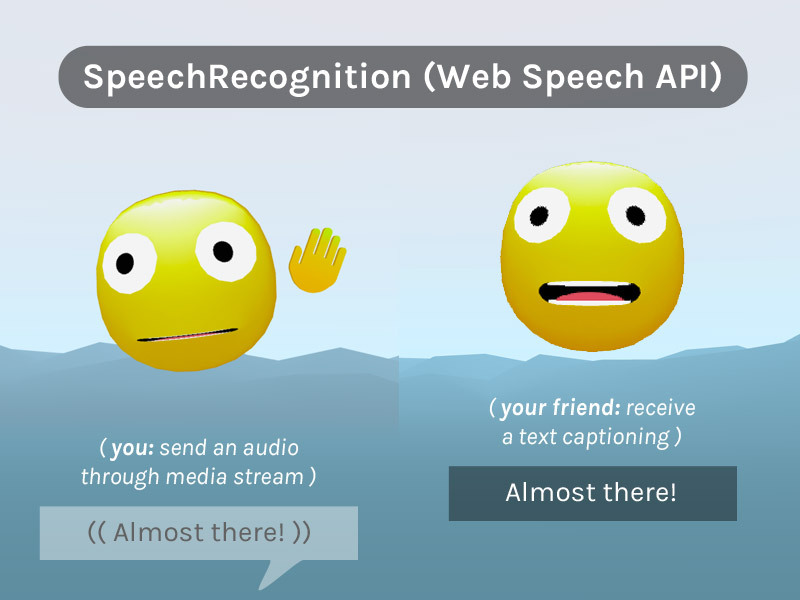 If the one of the users don't want to activate the microphone, with SpeechSynthesis gives us the possibility of transform a text received to an audio. Or if both doesn't have microphone active, can receive this text as a captioning. A some resemblance to the previous, is if you send and audio and the receiver hasn't activated audio. In this case, with SpeechRecognition we could transform this audio to captioning in almost real time. 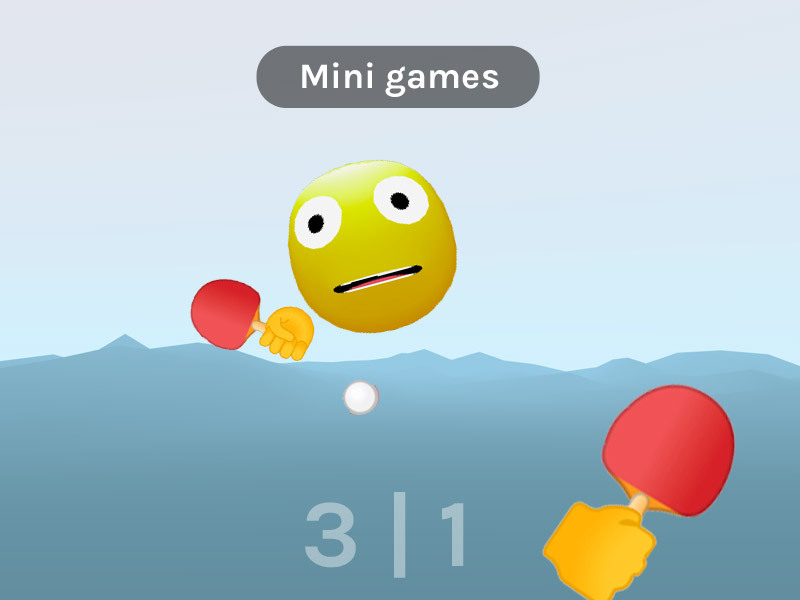 If both users has almost a controller, they could play multiuser simple games with (even) physics. 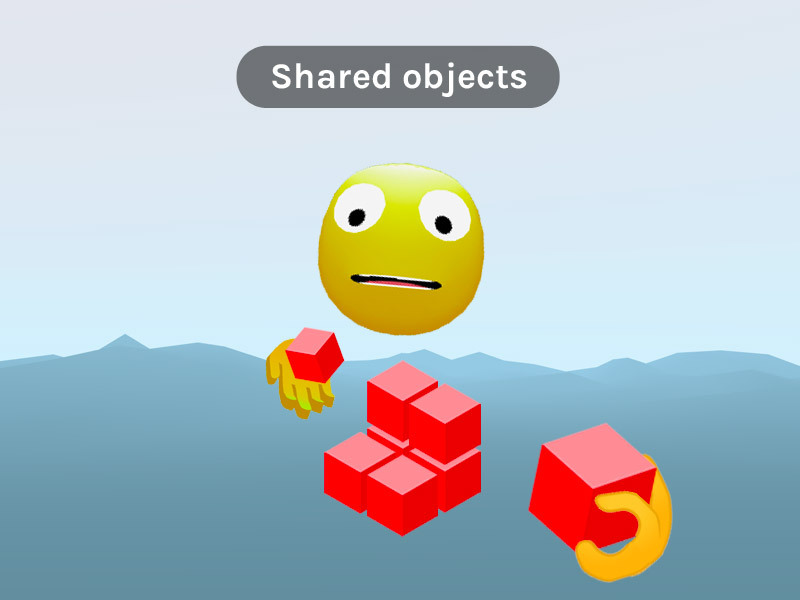 Another possibility is to play with shared objects which their position can be modified by both users. "I am open to collaborating in new projects and to work remotely with companies on real time render projects, especially if they are focused on AR/VR.